I’m obsessed with banana flavored things. Banana bread, banana ice cream, banana yogurt (yes! they make it!). I DONT like fake banana (aka laffy taffy) but real banana flavored things I absolutely adore. Which, go figure, I find weird because I’m not all that crazy about bananas themselves. Hmm. 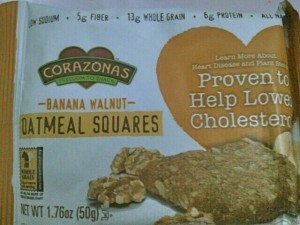 So, I got this free Corazonas Banana Walnut Oatmeal Square from the company to review, and I was pumped. BANANA walnut. Even if it was Banana spinach flavored oatmeal square I probably would have been excited. Ok, maybe I’m overexaggerating, but let’s just get it out there that I love banana. 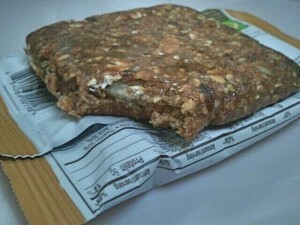 So, pregym, I had this bar with a scoopful of peanut butter. It was one of those mornings where I DID NOT want to wake up early and have a proper breakfast before the gym, so a granola bar would suffice. Although, always prepare for the munchies later on if you don’t have a big breakfast! Or at least that’s the case for me! ANYWAY- this square was really quite good. It was soft, chewy and dense, and you could really taste the banana. It tasted like genuine and real banana for the most part, but did have a tinge of that “artificial flavor” feel to it. But not too bad. And not like laffy taffy (sorry to those who love laffy taffy- can’t do that fake banana flavor!!). There was a slight cinnamon flavor, and it was certainly sweet! The oats gave it a hearty texture and it was a rather satisfying bar. I felt energized during my workout (trust me, I hardly sleep anymore so I definitely didn’t get the energy from a solid 8 hours of sleep! ) and I couldn’t get over how banana-y it was. The whole “walnut” aspect of this bar was lackluster for me. I don’t even know if I remember tasting them?? Magical walnuts perhaps…? Anyway- 4 stars. A good bar. I would buy it in the future. 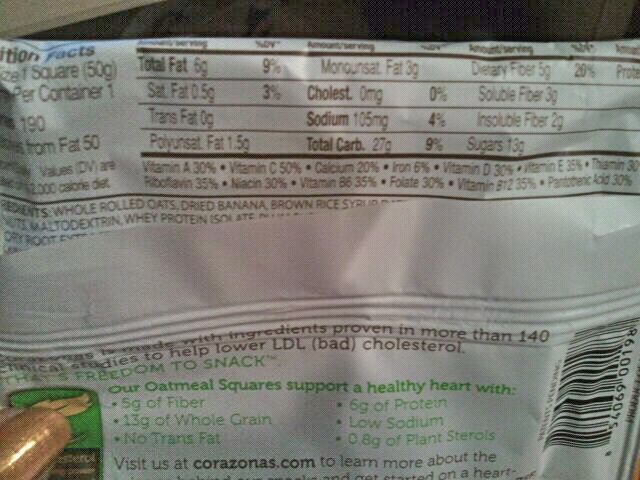 I'm such a fail at taking pictures of nutritional facts. Boo. Remember my oatmeal debate? How I’d love to eat oatmeal all the time since it’s healthy, filling and deliciously versatile. But, I’m, well lazy. I don’t like cleaning pots, or waiting for the oatmeal to cook. Especially if a cold bowl of cereal is ready in five minutes after slciing up some fruit and pouring some almond milk. It’s just too easy! 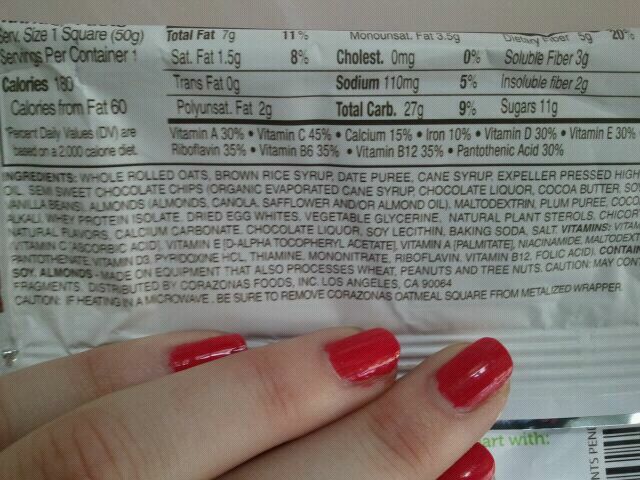 However, I discovered I could still eat those healthy oats, but in an oatmeal square. 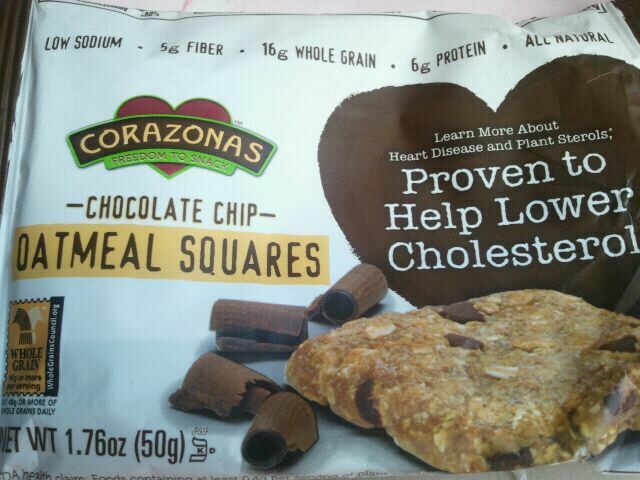 I enjoyed the Chocolate Brownie with Almonds Oatmeal Square by Corazona, so I was sure I would also like the Chocolate Chip Oatmeal Square they sent me to try for free as well. 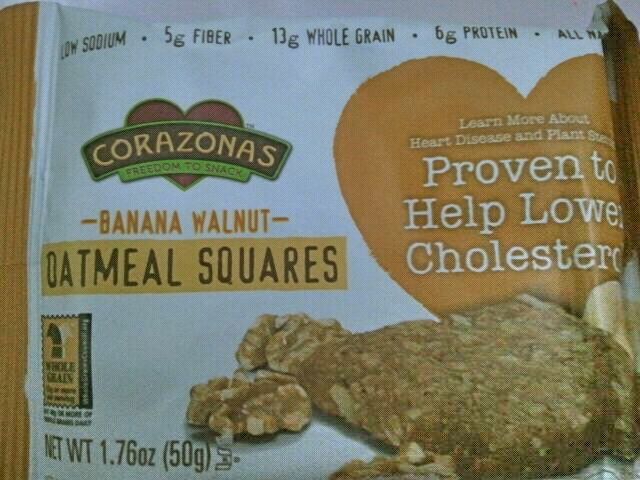 Some quick facts from the wrapper, this oatmeal square has 16 grams of whole grain, is all natural, and “is made with ingredients proven in more than 140 clinical studies to help lower LDL (bad) cholesterol”. This bar was actually really tasty. It was decently sized, about the size of my palm. It was sweet and almost fruity in flavor, it was chewy and a bit dense, but really good. It was light and slightly sticky as well. It had a mild oatmeal cookie flavor, but wasn’t as sweet as an oatmeal cookie would be. The chocolate chips added a nice touch, and tasted like a smooth milk chocolate. 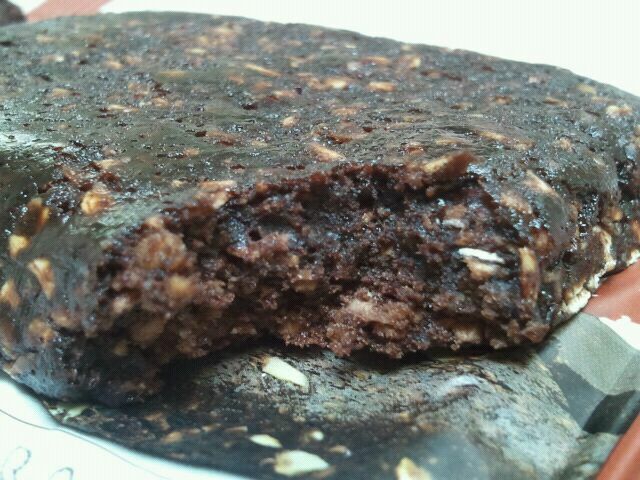 Also, the texture and taste almost reminded me of a sticky banana bread. It was really quite good! I’m an oatmeal kind of girl. Well….. I mean I eat cold cereal for breakfast 6 out of 7 days of the week, but oatmeal is certainly on the top of my list for things I like to eat. I just hate cleaning pots and instant oatmeal is never as satifying as stove top. SO basically, I’m a lazy oatmeal lover, where if it’s there, I’ll eat it, but if I have to cook it, I might just have cold cereal and wish it was oatmeal. But what about an oatmeal square? 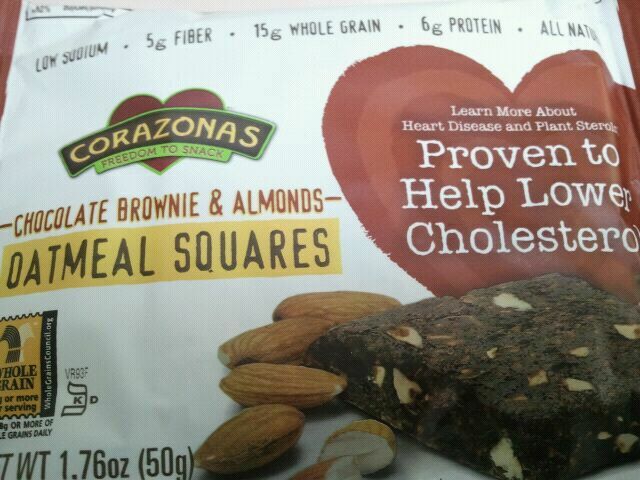 Corazonas Chocolate Brownie & Almonds Oatmeal Squares got me covered. They incorporate the oats that I really should eat more often, and pair it up with chocolate. And almonds. 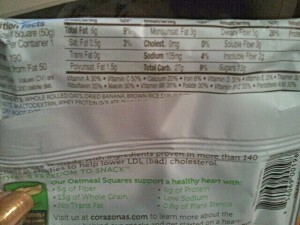 And according to the wrapper, also “.8 grams of Plant Sterols” and “15g of Whole Grain”. That’s my kind of snack. Overall, 4 stars. I like it. It’s a little small, but it’s a good snack for me on the go or before a workout, or to pair with some fruit and a glass of milk for a light breakfast. I like that it was sweet enough to feel desserty, but not too sweet where I have a headache. (headaches from sugar? Not. Fun. Been there, done that, too many times. You think I’d learn! I never do). So….if you HAD to choose… Cereal or Oatmeal for breakfast? tough choice, I know! I was provided this bar to try, free of charge.